Price £13.95 from Fantasy Printshop. 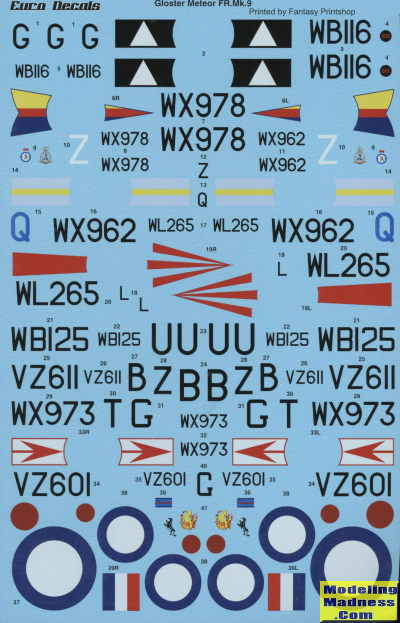 This sheet for the 1/48 modeler has markings for eight Meteor FR.9 aircraft. This plane was pretty well only flown by the RAF and most of the schemes are camouflaged in the dark sea grey/dark green over PRU blue scheme. The type was based on the F.8 and like that aircraft, some of these options have the early canopy. There are two kits of this plane in this scale. One is the Classic Airframes kit, which is probably a touch difficult to find and difficult to build. The other is the new Airfix version, which surprisingly, uses the same unit on its box art as the 1/72 MPM kit. This kit makes sense as it is just a simple nose job and does not require a lot of additional tooling, which would be the case for the round wing, round tail variants. Undoubtedly, the majority of modelers will pick this one, and this kit is probably why this sheet was produced. So here is what is on the sheet. 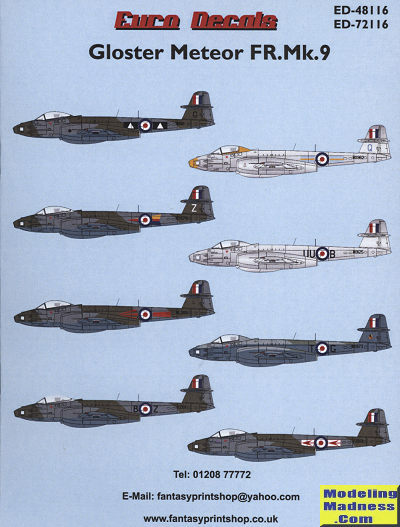 First up is a plane of 2 Squadron based in Germany during 1955. Next is an 8 Squadron plane based in RAF Sharjah in 1959. In high speed silver is a 208 squadron aircraft based in the Middle East during the 1950s. This has the early canopy. The first of three 79 Squadron planes is next from 1955 with large red arrows on the fuselage. Next is a plane of an unknown unit with the fuselage codes of BZ in the UK during the 50s. With a very high demarcation line for its underside PRU blue is a 79 squadron plane based in Germany during 1953. This aircraft has code letters on the fuselage instead of the colorful unit bands. Finally, the same unit at a later date with the nice fuselage bands. The decals are very nicely printed and it comes with a well done instruction booklet. A nice selection of markings for the Meteor fan. Thanks to Fantasy Printshop for the review sheet. You can find this sheet at this link.